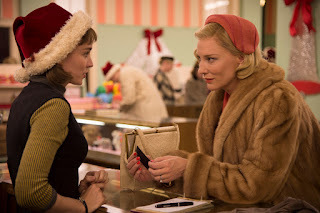 A young woman in her 20s, Therese Belivet (Rooney Mara) is a clerk working in a Manhattan department store and dreaming of a more fulfilling life when she meets Carol (Cate Blanchett), an alluring woman trapped in a loveless, convenient marriage. As an immediate connection sparks between them, the innocence of their first encounter dims and their connection deepens. Based on Patricia Highsmith’s seminal novel, The Price of Salt, adapted by Emmy nominated screenwriter Phyllis Nagy, directed by Todd Haynes, CAROL stars Cate Blanchett, Rooney Mara, Kyle Chandler, Jake Lacy and Sarah Paulson and is set for release on 27 November.